Today, in 1966, President Charles de Gaulle opened the world's first tidal power station at the Rance estuary, in Brittany (shown above). 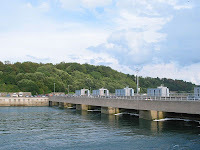 La Rance is the most powerful tidal power plant in the world and uses Barrage Technology, and works very similarly to a dam. With its width of 700 metres, the barrage blocks the Rance estuary situated near Saint-Malo. The operation of the dam is similar to that of run-of-river power plants since its head is also low and there is a substantial flow rate. At high and low tide, the water builds up rapidly on one of the sides of the dam. When the difference in level is sufficient, the gates are opened and the water rushes into the dam. The turbines are reversible so as to be able to operate regardless of the direction of water flow. Each year, the power plant generates 500 million kWh. 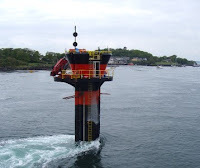 In July of this year, Tidal Power was used for the first time on the island of Ireland when Marine Current Turbines Ltd started to produce electricity in Strangford Lough using their SeaGen technology, a horizontal axis turbine. The system takes advantage of the fast tidal flow in the lough which can be up to 4 m/s. Although the generator is powerful enough to power up to a thousand homes, the turbine has a minimal environmental impact, as it is almost entirely submerged, and the rotors turn slowly enough that they pose no danger to wildlife. Below are photos of the working SeaGen installed in Strangford Lough and the turbines in the yard of Harland & Wolff in Belfast before installation. If anyone would like to research more on SeaGen and submit to the blog click here.